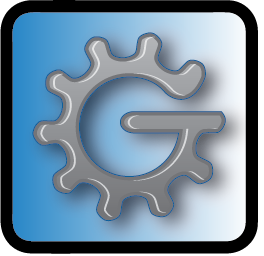 GI LLC is happy to release Graderworks 3.00! 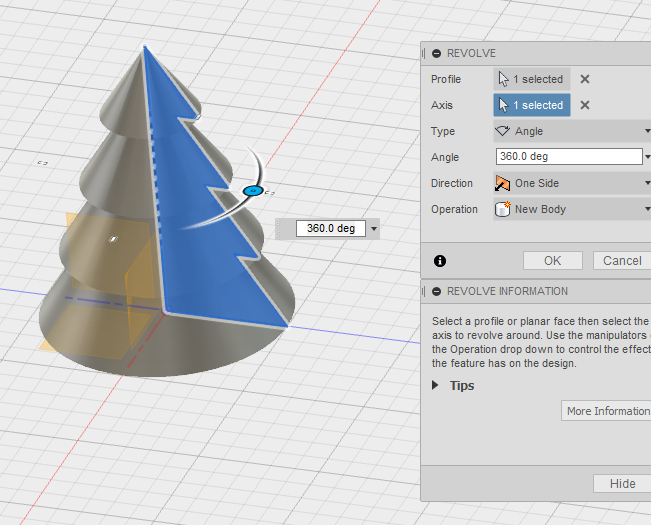 Version 3.00 incorporates many new features and functions which will help you grade your student's SOLIDWORKS files quickly and efficiently. Customize the Plagiarism checks which you want to use. A new configuration tab allows you to select the plagiarism checks which you find most helpful. A new plagiarism check has been added which checks for files older than a date that you specify. This check allows you to quickly identify files which were created in a previous semester of the class. Volume. The student's file must be within a specified tolerance of the solution's volume. Material selection. The student's file must use the correct material. Shape. The student's file must have the same shape as the correct answer. The shape similarity check allows you to assign partial credit based on how similar the student's file is to the solution shape. Center of Mass. When grading rigid assemblies, you can test to see if the student's assembly file has the same center of mass as the solution's center of mass. This check is helpful when teaching students how to align parts with respect to the top, right, and front planes of an assembly. 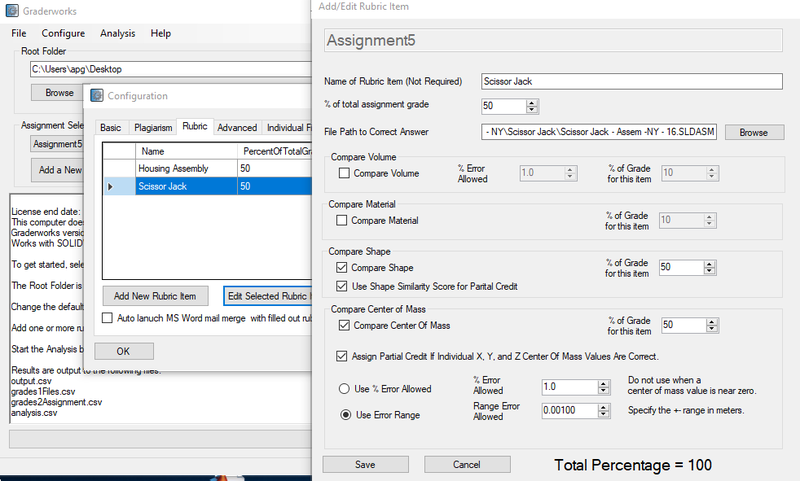 You can specify the weight of the total grade for each rubric item. 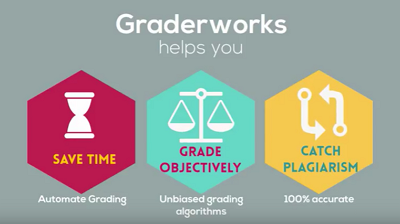 Graderworks outputs three grading files. File Grades. 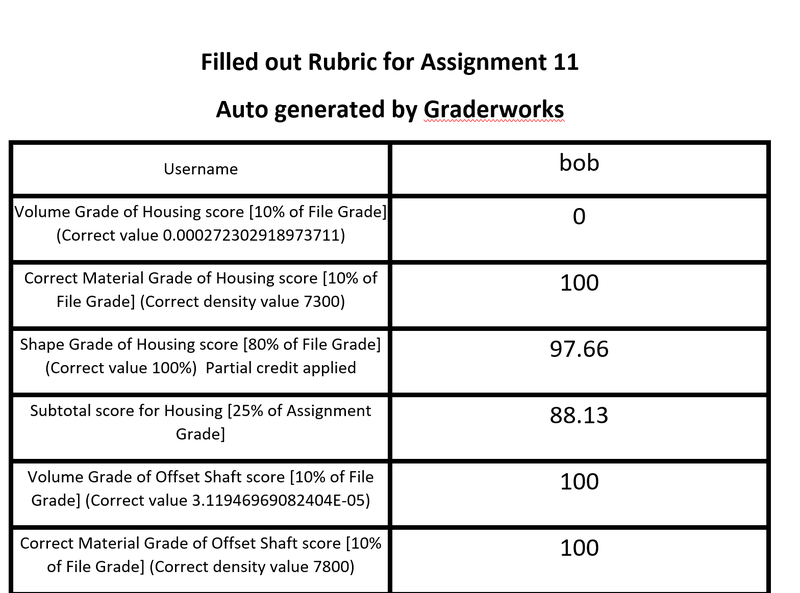 Graderworks determines the grade for each file that the student submitted. It shows how the file was graded in the rows and columns of the files. Assignment Grades. Graderworks determines the complete assignment score for each student based on how they scored on each file. Each row specifies the grades for a single student. Combined File and Assignment Grading for mail merge. 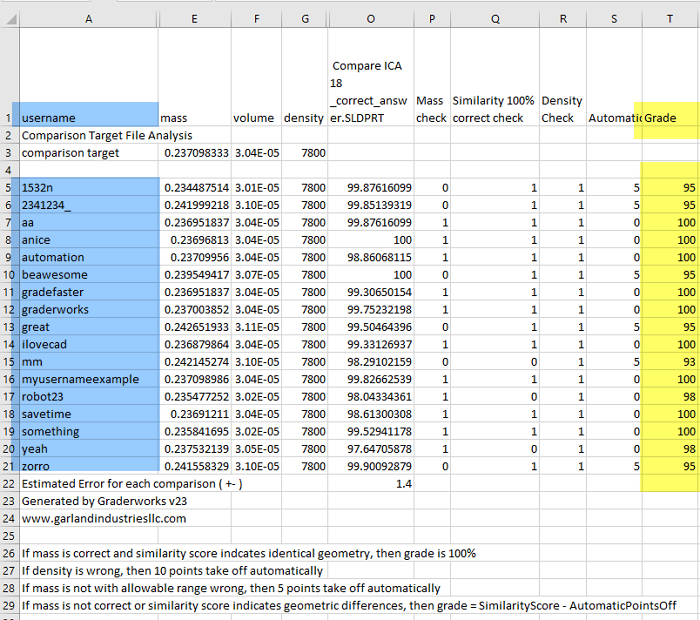 This .csv file shows how the student scored on each rubric item. All the data for a single student is on a single line. This format enables Graderworks to automaticaly launch a mail-merge document with a filled out rubric for each student. When setting up the rubric items, you can select "Auto lanuch MS Word mail merge with filled our rubric data when grading is finished" to enable this automatic mail merge. Re-export existing data. Graderworks can rexport existing saved data. Just select the assignment, then click on Analysis->Export Existing Saved Data. Add more files to an existing assignment. If your files are in several locations, then you can run Graderworks several times for a single assignment. This feature is helpful if a student submits a late assignment, but you would like to add their late assignment to the plagriarism check and to autograde their files. 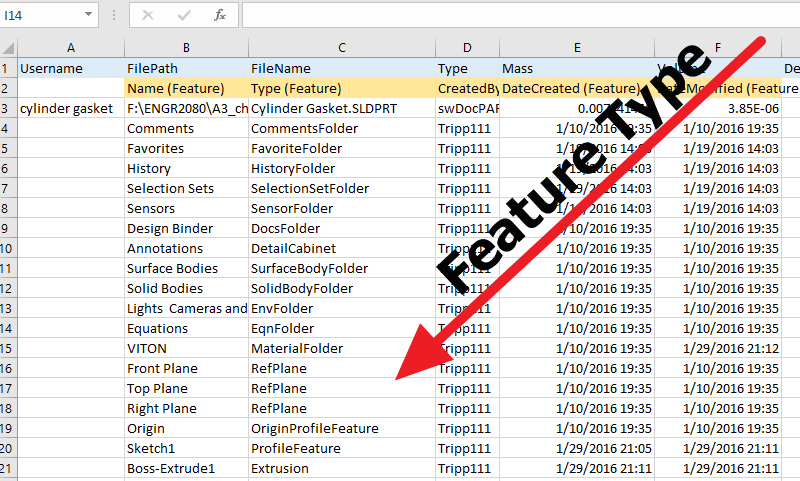 Graderworks now exports to an Excel file with several sheets instead of exporting to several csv files. 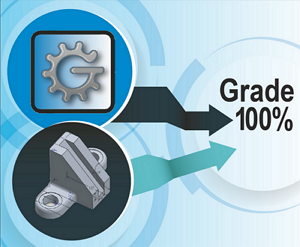 Download your free trial of Graderworks today! 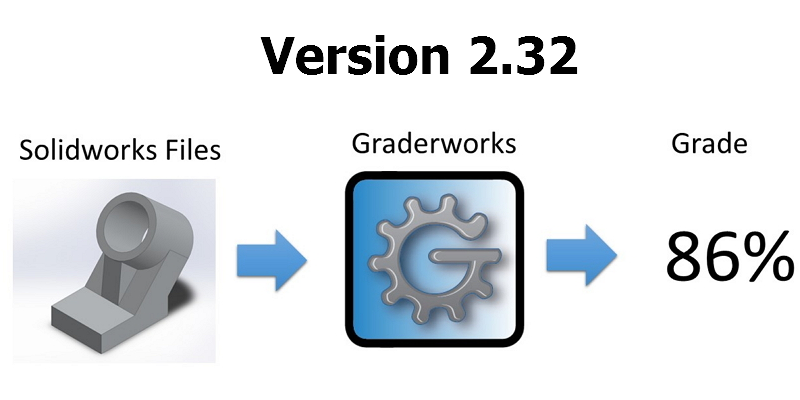 Several more improvements have been made to Graderworks in version 2.35. 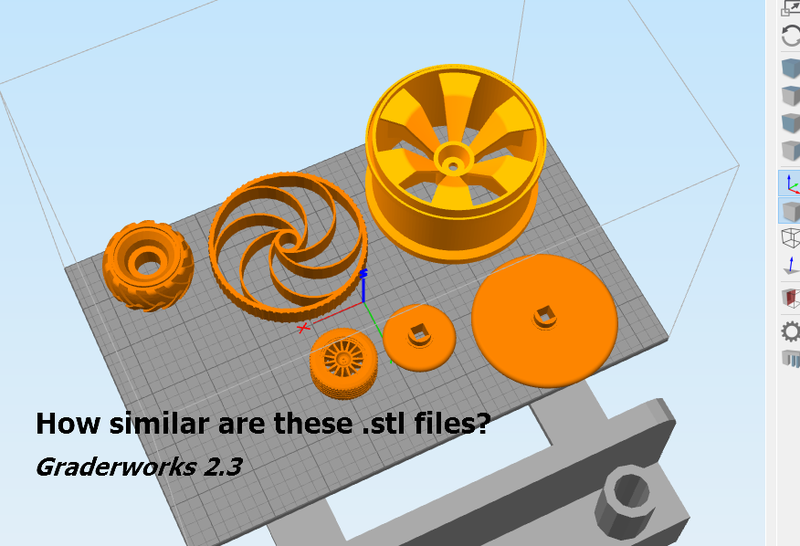 Update on Graderworks 2.3 Several major bugs were fixed. 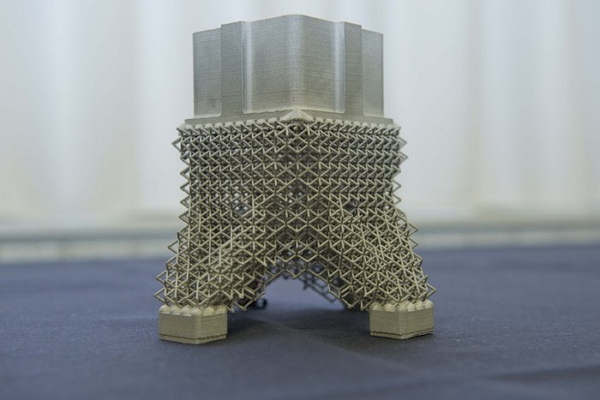 What is unique about 3D printing? 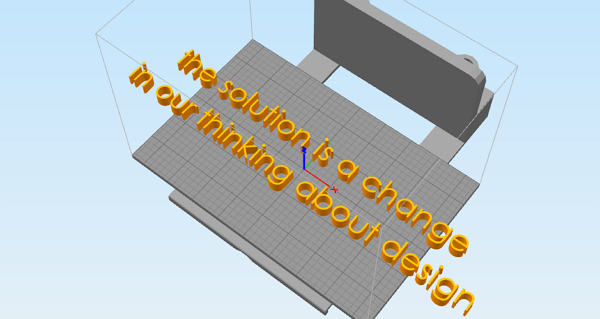 What should we 3D print? Software, dying on the journey from academic project to commercial tool.